These Pet Rescue level 644 cheats and tips will help you beat level 644 of Pet Rescue. The objective of Pet Rescue level 644 is to rescue 6 pets and get 3,000 points. 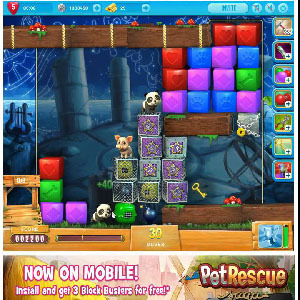 The right side of the board in Pet Rescue Saga level 644 is filled with metal and glass blocks. In these blocks you will find the pet crates, bombs, and star blocks. Look to clear out these blocks from their metal and glass as quickly as possible. Continue to make matches on the left side of the board until you can drop down these blocks and make combinations. In this level you will be give the paint brush booster. This booster will come in handy when you need to break open the metal and glass blocks. Look to paint the blocks that are underneath these blocks to help you drop them down to the bottom more quickly. Once you have broken the pets from their cages, look to bring them down. You may need to continue to break open the metal crates until you can bring the pets to the bottom. Focus on where the pets are on the board and which columns you need to clear out. Look to use the paintbrush booster to help you.